The AmeriGlo Pro i Dot replacement sight set for the SW MP replaces the factory sights and changes the sights too single dot alignment night sights. These sights are designed for quick sight alignment in low light conditions and includes both the front and rear sights. The front sight is a green Tritium dot outlined in a lime green circle. 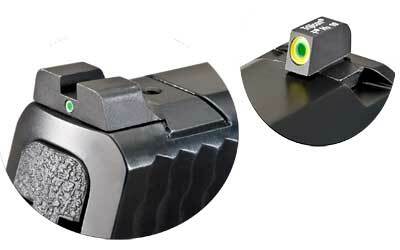 The rear sight is a tritium dot outlined in a white circle.